Compact, bushy plants start blooming early, continue all summer to frost. Uniformly large flower heads up to 5" across in dazzling shades of cherry, scarlet, deep rose, orange-scarlet and white. Excellent for containers and sunny gardens. Geranium, Border Mix is rated 4.6 out of 5 by 11. Rated 5 out of 5 by Steph86 from Easy to grow! I started these geranium seeds in early February and they were starting to bloom mid May. High germination rate. Sturdy plants with a nice variety of colors. I have them both in full sun and in mostly shaded areas. They are doing well in both places. Will purchase again! Rated 5 out of 5 by Andrea H from Easy and lovely! I had never grown flowers from seed before trying with these geraniums. It was very easy! They germinated, grew well, and were beautiful. It was interesting to see which colors would emerge. I potted them and gave them as gifts, and the recipients were excitely sending me pictures of the brightly colored blooms. I will buy these again. Rated 1 out of 5 by blackie17 from poor showing Started seeds in an Aero Garden. They all took. Plants are small maybe 5 inches across. Bloom is a single flower. Very disappointed show. Also the deer like them. Rated 5 out of 5 by lucky7s from best flowers ever!~ These geraniums are so easy to grow and gorgeous plants. I have 1 pink petal with pink splash and 1 red and have had for 3 years. I cut them back and repotted and they are growing again. I had white, cherry red, red, pink, pink with pink splash and a pretty orange one!! I highly recommend them. Rated 5 out of 5 by cmp05 from Very happy with these seeds! This is my second year growing Border mix. Both last year and this year, every seed germinated, and I am expecting a bounty of beautiful geraniums again this spring and summer. I prefer growing from seed -- so much cheaper than buying plants from the nursery. These will definitely be a yearly purchase! Rated 5 out of 5 by jjjjjj from BEAUTIFUL Planted in a 4' wide border beside my screened patio. 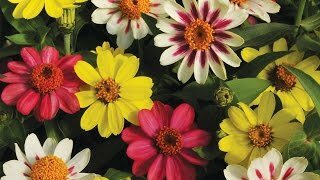 Large healthy plants with showy blooms even though they get less than 3 hours of sun a day. Rated 5 out of 5 by Maya from Amazing mix Last year I ordered few packages of this border mix and planted pretty late, in February. I had germination rate over 95%. Most plants I planted in the garden and only a few in the pots. They grew beautifully in both places (even in the hot weather) and I loved the colors. I saved some for the next summer, but will definitely order more. Rated 5 out of 5 by 50andhappy from First time starting from seed. I'm very pleased. I had more than 50% sprout. I will purchase again.